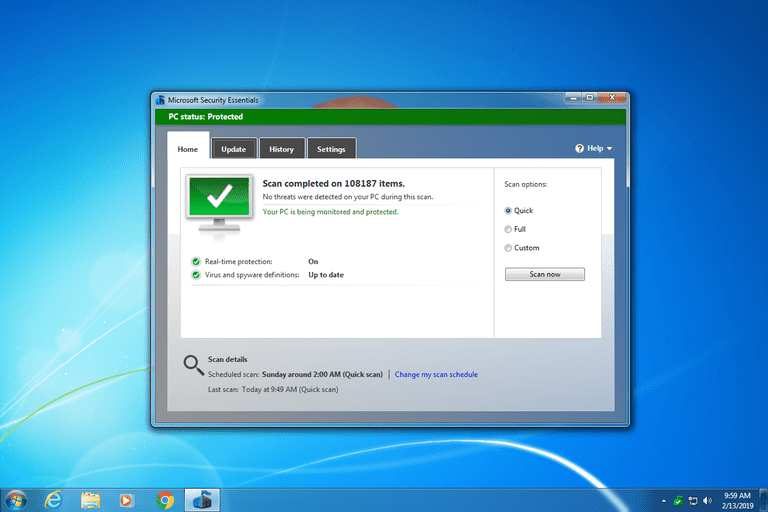 Microsoft Security Essentials (MSE) is easily one of the best free antivirus program available. We like it because it's produced by Microsoft and because it's really easy to see if the program is protecting you as it should be. This tool lets you run a quick scan to check for threats in common areas where viruses likes to hide, but you can also run a full scan to check everything or a custom scan to look in specific folders/drives only. Microsoft Security Essentials provides constant virus protection, also called on-access or resident protection, for free. This means that Microsoft Security Essentials can completely replace antivirus software from companies like McAfee and Norton that charge for their software and for yearly access to updates. There are inconsistent reports that Microsoft has recommended that people do not use just MSE, but instead use a third-party antivirus tool from another company. For what it's worth, I use MSE on many of my computers and it seems to protect them just fine. Like any antivirus program, MSE has several features to help fight off threats, and does a good job at balancing ease-of-use with functionality. Security Essentials is Microsoft's first attempt at an antivirus program, free or otherwise. Our take: they did an excellent job. It was super easy to install and even easier to understand and use. Microsoft Security Essentials even trumps most of the popular, expensive antivirus options out there. It's unfortunate, however, that Windows XP is no longer supported. Also, I'm a fan of being able to access shortcuts to settings when I right-click the program icon from the Windows taskbar, such as to temporarily stop real-time protection. However, that's not possible with Microsoft Security Essentials. The only thing you can do from there is open the program. There are two download links on Microsoft's website, and the one you need to pick depends on whether you're running 32-bit or 64-bit Windows. Choose ENUS\amd64\MSEInstall.exe for 64-bit version or ENUS\x86\MSEInstall.exe for 32-bit.